This recipe is adapted from Sheila Lukins' [%bookLink code=1563052377 "All Around the World Cookbook"]. When my friend Jess made this for my vegetarian household, she left out the bacon and served the chowder with an avocado salsa. Strip corn from cobs; set aside. Simmer cobs, broth, and garlic in a pot, partially covered, for 10 minutes. Discard cobs and garlic. Stir in the potatoes and half of the reserved corn. Simmer, partially covered, until potatoes are tender, 10 to 12 minutes. Purée; transfer to a bowl. Stir in the milk, salt, and pepper; reserve. Cook the bacon in a pot over low heat to render the fat, about 6 minutes. Add the onion; cook for 10 minutes. 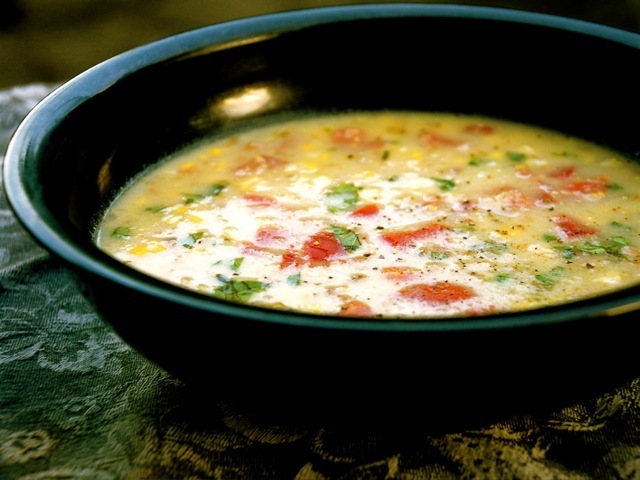 Add the reserved soup and remaining corn; simmer for 8 minutes. Stir in the tomatoes and basil. Serve immediately. When necessary, add 2 tablespoons of olive oil to the pot if your bacon is lean. Be sure to read Jamie Passaro's essay on post-partum potluck.